Abstract: Standing just 69mm tall, the Raijintek Pallas CPU cooler is probably the largest low profile heatsink Frostytech as tested in recent memory. Standing just 69mm tall, the Raijintek Pallas CPU cooler is probably the largest low profile heatsink Frostytech as tested in recent memory. The nice thing is, instead of being equipped with a dinky 92mm or 120mm fan, the Raijintek Pallas ships with a 13mm thick, 150x140mm vaneaxial fan capable of 1400-650RPM and a maximum 56CFM airflow! 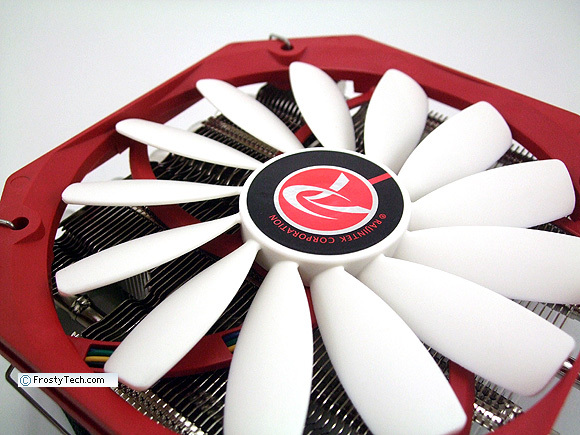 The use of a 13mm thin fan allows the heatsink to bulk up the cooling fins somewhat, slightly increasing cooling surface area over what would have been feasible with a 15mm or 25mm thick fan. When selecting a low profile heatsink for a computer build, motherboard clearance issues are always an issue. 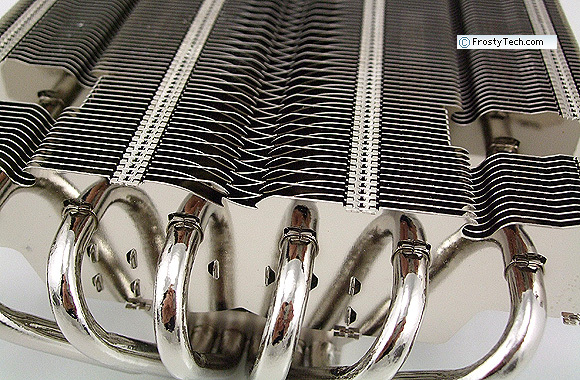 In the case of the Pallas heatsink, clearance problems are mitigated somewhat by varrying the thickness of the heatsinks' nickel plated aluminum fins from 32mm thick over the CPU socket to 22mm thick in the surrounding area. That won't be enough to pass over RAM modules, but capacitors and surface mount heatsinks should be cleared on many boards. The heatsink itself has an asymmetrical layout, with the CPU base plate riding tight along one edge of the 151x153mm footprint. 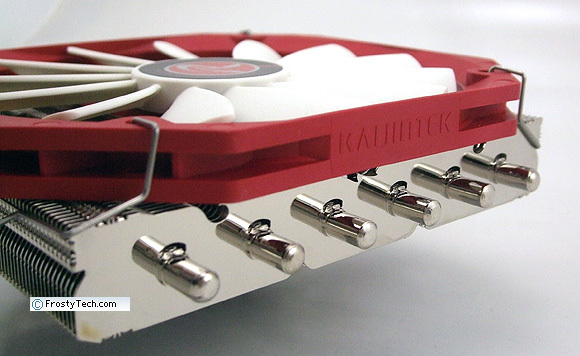 Raijintek's low profile Pallas heatsink is constructed around six 6mm diameter copper heatpipes and a 120x140mm array of nickel-plated aluminum fins. A chunky copper base plate helps spread the heat to the six heatpipes. 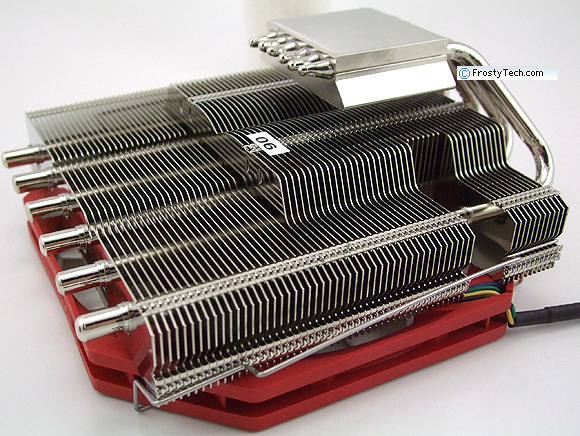 The Pallas heatsink weighs 420 grams and ships with a 140x150x13mm PWM fan that spins at 1400-650RPM. As you'd expect, Raijintek's Pallas heatsink is compatible with socket LGA2011/1366/115x/775 Intel Core i3/i5/i7 processors and the complete line up of AMD socket AM2/AM3/FM1/FM2 chips. Retail price is estimated between $29-39USD. Mounting low profile heatsinks is often a challenge, but Raijintek's Pallas seems to take a page from the Noctua play book in this regard. Once the board mounting brackets are in place, a single fulcrum plate rests across the base cap of the heatsink and two screws apply the clamping force to keep the Pallas steady. The system isn't problematic, so long as you have a magnetic tip screwdriver to feed the two clamping screws in through the top of the heatsink. To our pleasant surprise, wire fan clips hold the 140x150x13mm fan in place. 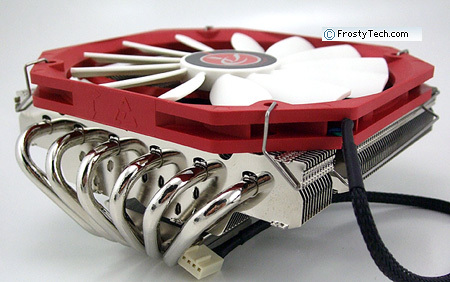 At the time of this review Frostytech is also testing tower cooler from Raijintek which uses those infernal rubber fan mounts... but that's a story for that review. From this angle you can see how Raijintek stepped the thickness of the aluminum cooling fins down from 22mm thick along the bulk of the heatsink, to 32mm at the center. This will improve motherboard clearance issues in many, but not all cases. On the next page of this review Frostytech lists dimensions from the center of the Pallas' base plate out, so you can measure clearances in your computer system if you wish. Raijintek's Pallas heatsink can be installed onto Intel socket LGA2011/1366/1156/1155/1150/775 processors and AMD socket AM2/AM3/FM1/FM2 CPUs. Installation is pretty straightforward as the main metal mounting bracket is shared between the two AMD and Intel platforms. It's best to use a magnetic tip screwdriver when feeding the two clamping screws into position, and work with the PC case laying horizontally. A small pack of thermal compound is included though. List all Raijintek heat sinks that Frostytech tested?